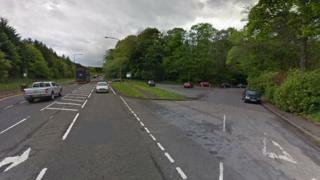 A cyclist has died after being struck by a car in West Lothian. The collision took place on the A89 near Dechmont, close to the entrance to the Bangour Hospital site, at about 17:20 on Wednesday. The 37-year-old man was seriously injured and was pronounced dead on his way to hospital. Police officers investigating the crash have appealed for any witnesses who have not yet spoken to them to get in touch. The car involved was a Mercedes C220. Sgt Brian Smith said: "Sadly as a result of the collision the cyclist lost his life and our thoughts are with his family and friends at this incredibly difficult time. "A number of people who were driving on the road at the time stopped to assist and we are thankful to them for their assistance. "I'd ask anyone who may have witnessed the collision, and has not yet spoken to officers, to come forward to assist with our inquiries. "Any driver who may have dash-cam footage is also asked to get in touch and provide this at their earliest opportunity."